Art and Culture Theory Courses are configured from an arts and culture environment system and content-based arts and culture. Research is conducted on fine art (painting), literature, performing arts (music, opera, theater), and fashion art and how they are related to society. In content-based arts and culture, social awareness and the worldview reflected through analysis of artwork are considered. 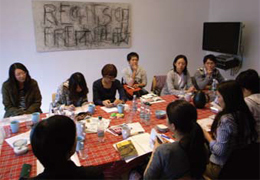 In the arts and culture environment system, art management connecting the arts and society is examined and the grand design of cultural policies, considering factors such as the guarantee of the right of easy access to art and actual cultural facility management are compared internationally. In this course, we welcome candidate students, regardless of their undergraduate major, who are interested in art and supporting its environment as well as those who are keen to undertake specialist learning. Master’s program: Local community, Public theater organizational management, Network formation between non-profit organizations, Community art,Social and Cultural Center in Berlin, Civic activities and cultural policy in Sweden, Cultural policy in Singapore, Protection and application of cultural heritages: historic sites of France and China, City space improvement in Paris, Church building during the Russian Imperial Period, Japonism, Tadamasa Hayashi, French Impressionist painter Gustave Caillebotte, French Women Writer, Japanese avant-garde calligraphy and abstract expressionism painting,Women and modes in France, Japanese Street Fashion. Doctoral program: Cultural Policy and social inclusion, Modern advertising in Japan, Daumier and the modern city of Paris, Acceptance of modern French music in prewar Japan, Formation of Japanese ceramics collections in France and the trade between Japan and France, Kenji Miyazawa and the optics. Research fields: She specializes in post-1945 American art and its global impact, but she also conducts research and writes about postwar Japanese art. She is currently working on post-WWII cultural exchange between the United States and Japan and its relationship to cultural diplomacy in the Cold War period. Subjects: Special Lectures on Intercultural Art Theory. Research fields: Her research interests are French-speaking culture, particularly 19th century French literature and the problems of cultural identity and cultural policy in neighboring multilingual Belgium. Subjects: Special Lectures on Cultural Environment Formation Theory. Research fields: He is working on both theory and practice in music culture, cultural policy and art management. In recent years art has been noted as a tool for community revitalization and the realization of creative cities, but he wants to make clear that the public value of the arts is more diverse. Subjects: Special Lectures on Cultural Representation Correlation Theory. Research fields: Her specialty is modern French literature and art, but she is also interested in visual culture and sociocultural history of the West and Japan. She is also interested in comparative culture,the history of Franco-Japanese exchanges and gender studies. Copyright (C) Graduate School of Intercultural Studies, Kobe University　Faculty of Intercultural Studies, Kobe University All Rights Reserved.